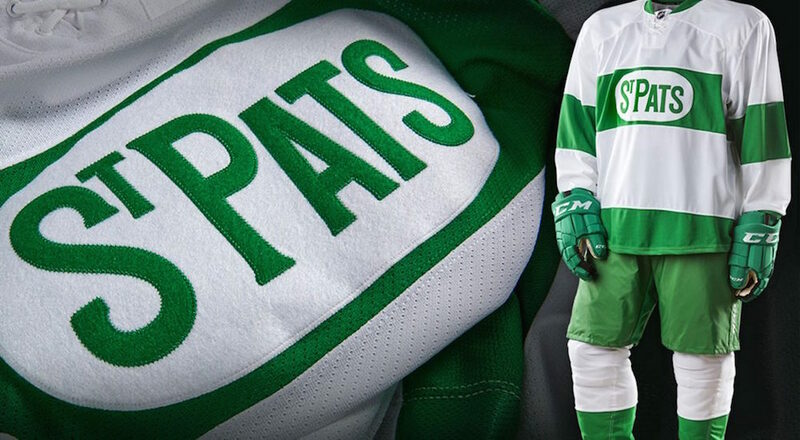 This Saturday, the Maple Leafs will be wearing Toronto St. Pats uniforms for their home game against Chicago. It’s a nod to the team’s heritage during its 100th season and, of course, to the fact that Friday will be St. Patrick’s Day. demanded he put on his regular Leafs uniform. Over the past few years, a man I have never met named Daniel Doyon has been emailing me notes about the books I write and corrections to errors he’s come across in the NHL Official Guide & Record Book. (And, honestly, he’s never sent me anything where it hasn’t turned out that he was right!) 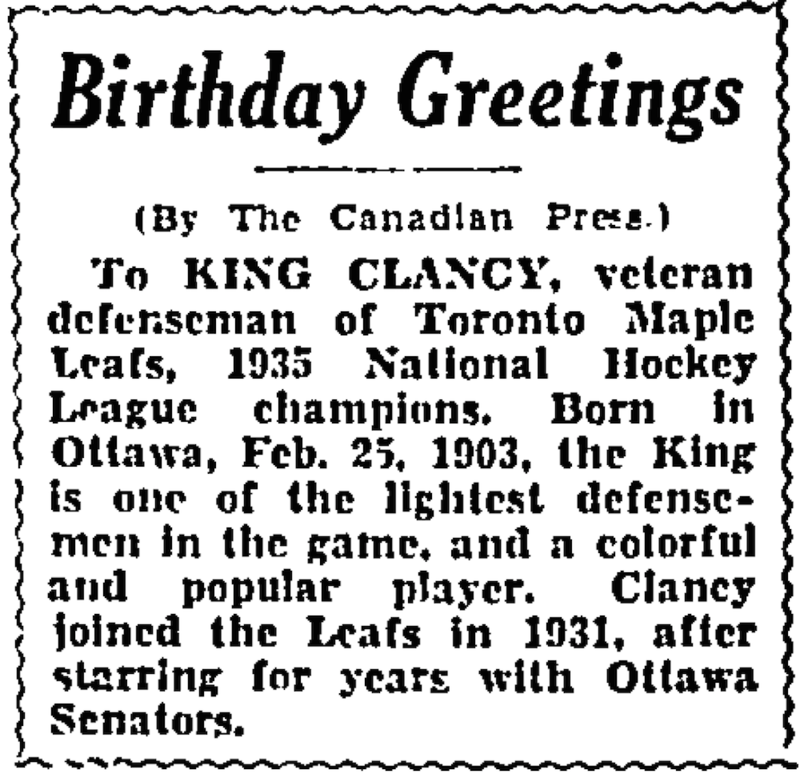 A few weeks ago, on February 25, he sent me a note saying that it was King Clancy’s birthday and did our records show he was turning 114 or 115, because although hockey sources have long listed 1903 as Clancy’s birth year, he’d come across a document indicating it really should be 1902. Even with web sites such as Ancestry.com and others like it, this type of research is far from perfect. 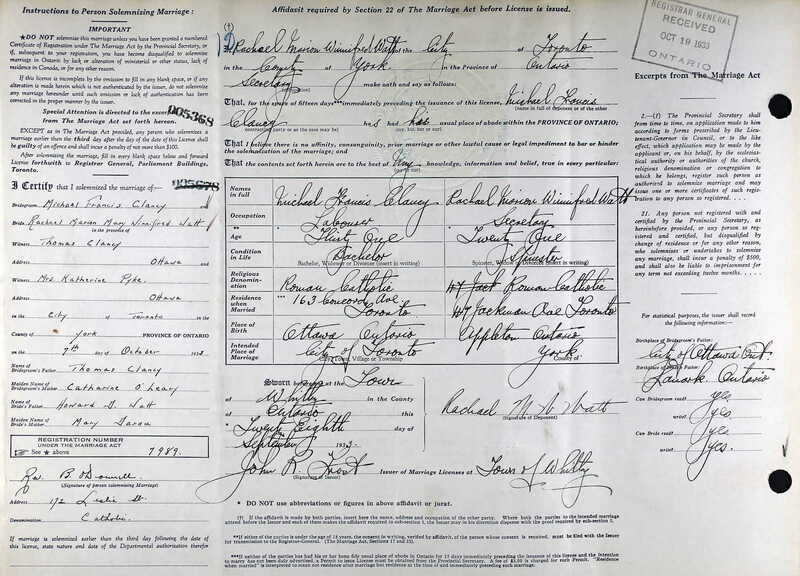 Despite the fact that King Clancy himself signed this document stating that “I certify the foregoing to be true and correct to the best of my knowledge and belief,” it was still 70 years after the fact. He could have been wrong. Even with Daniel’s track record, I needed more than this to go on. So, I checked the Census of Canada records. 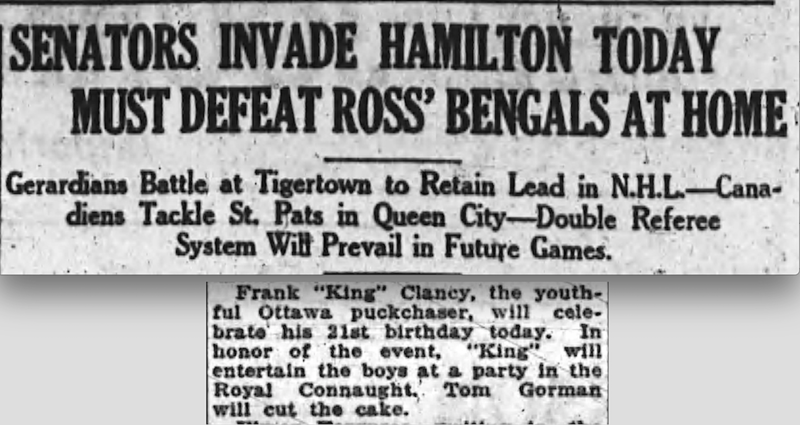 In 1911, Francis Clancy (he inherited his famous nickname from his father, Thomas, who was a rugby star known as “The King of the Heelers,” but he wasn’t born King Clancy!) appears to have had 1902 written overtop of 1901 (yes, it looks a lot like 1907!) and had his age of 10 crossed out and changed to a 9. In 1921, where no birth years are recorded, he’s listed as being 19 years old. But maybe not. Clancy’s name is supposed to be Francis Michael, not Michael Francis. Still, with everything else a perfect match, it must be him, right? 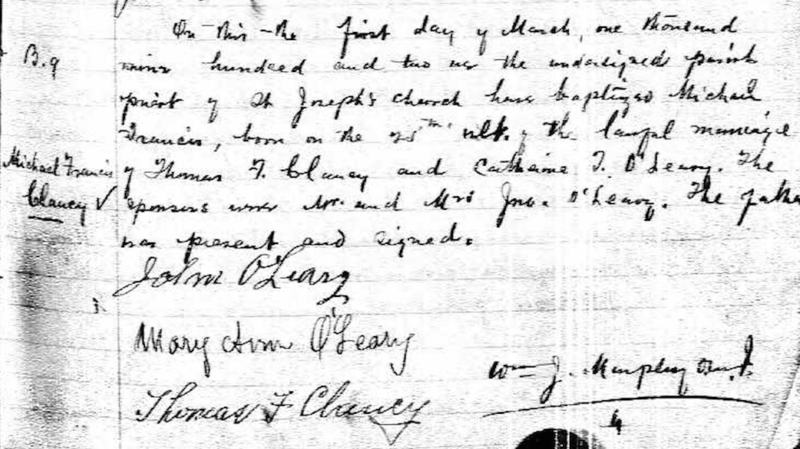 Fortunately, as it turns out, Clancy’s wedding record from 1933 also lists his name as Michael Francis (and shows his age as 31, which would again indicate a birth year of 1902). 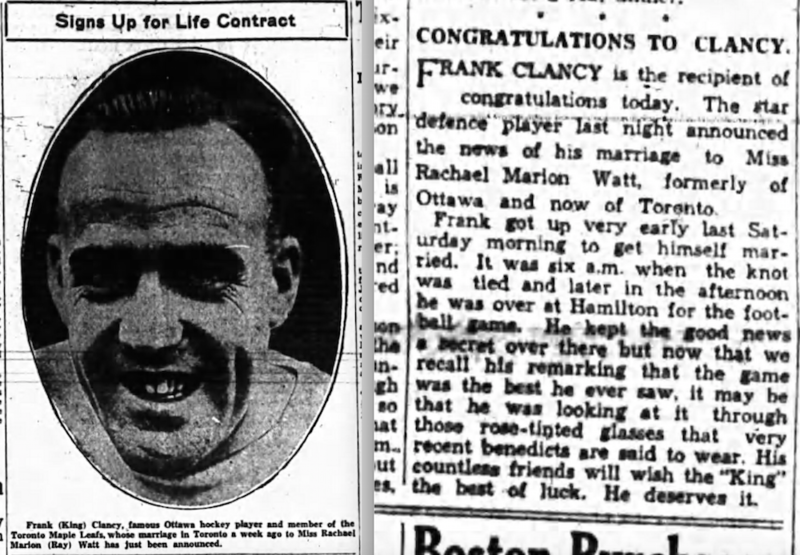 And to erase any lingering doubt about that record possibly being the wrong Clancy, newspaper coverage in both Toronto and Ottawa shortly after the wedding match the names and dates too perfectly for this to be anyone else. 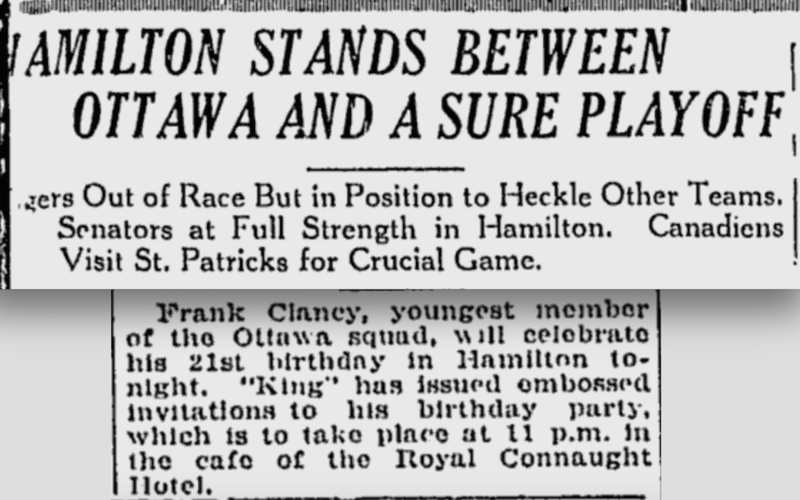 Ottawa Journal, October 14, 1933. So, I began to wonder two things. First, when did the NHL start to “officially” record birth dates? I sent an email to Benny Ercolani, who’s been with the NHL since 1976 and its head statistician since the 1980s. He didn’t know the answer. Neither has anyone else I’ve spoken to. Did Hendy solicit birth dates from players? And if he did, did Clancy decide around 1932 that he’d be better off as an aging NHLer who was 29-years-old rather than 30? Maybe. But that’s nothing more than a guess. To see if the Clancy family could shed any light on this, I contacted his son, Terry Clancy. When I asked Terry what he knew about his father’s age, he told me: “I know that he was 83 when he died (in 1986).” I told him that he may actually have been a year older than that, and then I asked him the second thing I’d been wondering about. Did he have any idea why his father filled out that form in 1972? I wondered if Clancy had needed a passport to go to Russia for the 1972 Series in September … but Terry said his father hadn’t gone. 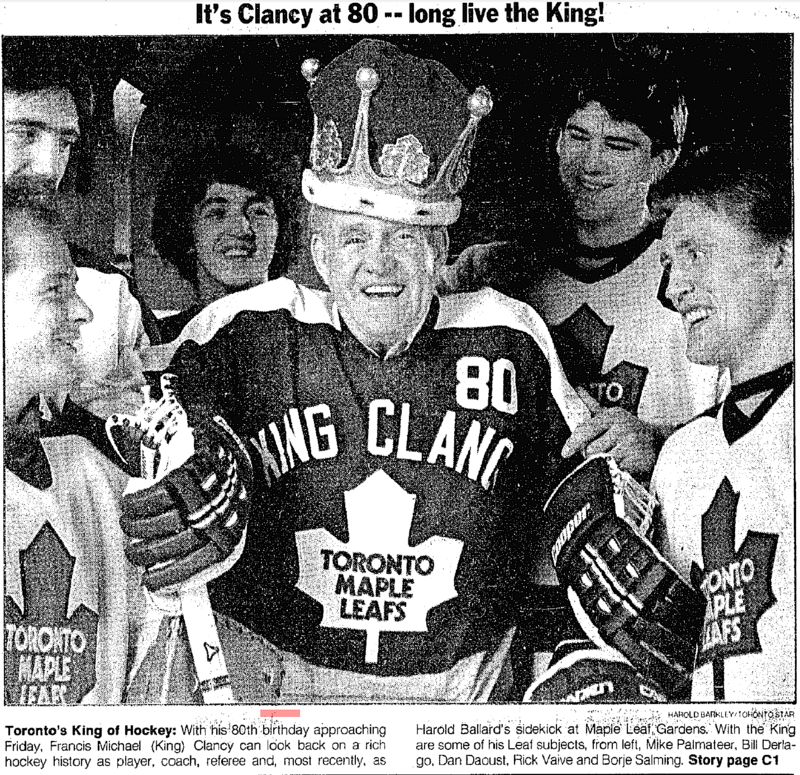 I also wondered, with Harold Ballard soon to serve a jail sentence for fraud, if maybe Clancy was suddenly worried about his job with the Maple Leafs and decided it might be a good idea to apply for his pension. Toronto Star, February 22, 1983. 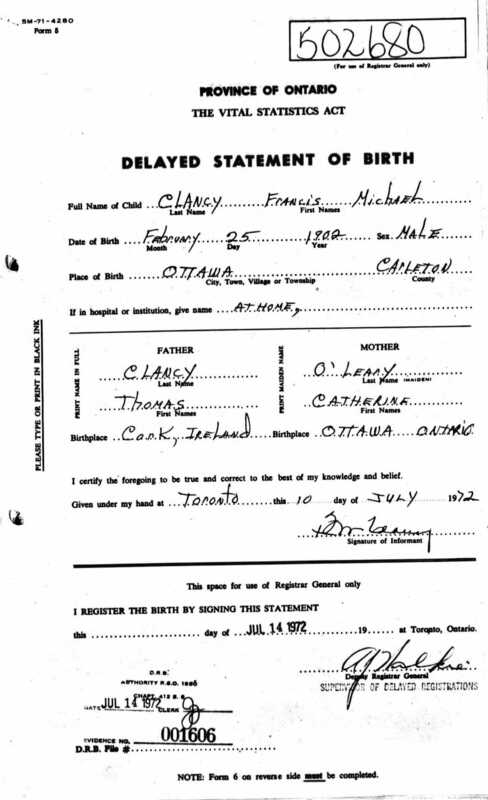 Despite having filled out that form in 1972, King Clancy certainly appears to have carried on as if he’d been born in 1903. He happily took part in 80th birthday festivities in 1983 – when he was probably turning 81. “My father never really cared about his age,” Terry Clancy told me. I wonder what he’d make of all this effort today! You are a very thorough investigator! I enjoyed reading this article. Thank you! Eric, terrific research on an interesting subject. Happy to help a little. As usual a very thorough investigative process to reach the truth, I really enjoyed it. There are a lot of routes that I don’t know how to take to find facts about hockey history, partly because my resources are very limited. You must have access to many different newspapers. I am limited to the Star, Globe, and Montreal Gazette. I have a rough copy of the 1936-37 Guide. I’ll e-mail you the page in a few minutes. I’m making spaghetti sauce for supper. My house smells good right now. Great sleuthing, Eric! 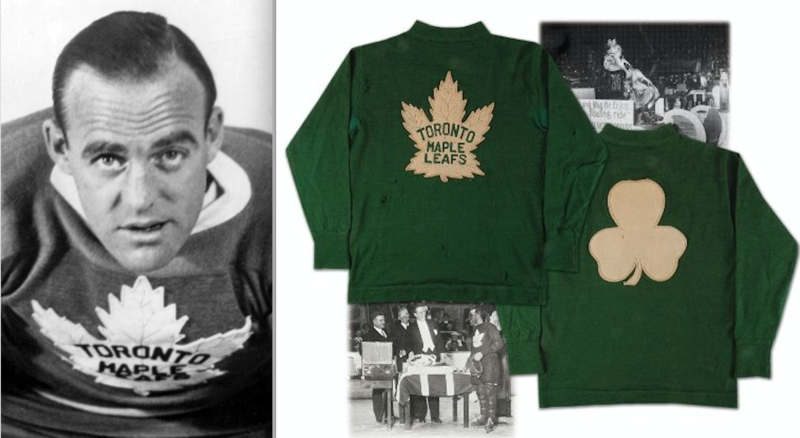 And as an aside, sorry to hear that Lester Patrick was such a stickler about the sweater.